Cllr. Kieran Dennison: €250,000 investment leads to record-breaking job creation in new Fingal businesses! €250,000 investment leads to record-breaking job creation in new Fingal businesses! LEO Fingal has this week approved a record-breaking thirteen job-creation grants to Fingal businesses, the highest level of approvals since the economic downturn. These new and established businesses are creating 24 new jobs immediately with a total LEO investment package of almost €250,000. 43 further jobs are expected to be created by the end of 2015. The businesses that have just been approved include three food companies, six manufacturing businesses (serving the construction sector, optical products, healthcare and beauty products), innovative filming services, jewellery, software and renewable energy. Stayhold Ltd., a Swords-based innovative business was also approved for second stage funding to accelerate this business’s ambitious global expansion plans. 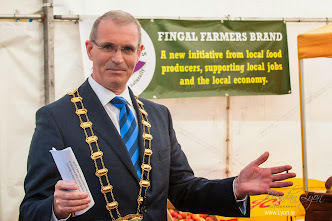 In early October, LEO Fingal hosted the biggest Local Enterprise Week ever held in Ireland. Highlighting the significance of the grants announcement, Head of Enterprise at Fingal County Council, Oisín Geoghegan, said “We are seeing a significant increase in commercial activity in Fingal. Business confidence is growing and economic growth is translating into real investment in job creation.” “LEO Fingal will continue to foster this growth and help small businesses create new jobs and opportunities”, he said. “This funding we are providing to 13 Fingal businesses will result in 24 immediate new jobs and at least another 43 new jobs before the end of 2015”, he said. Chief Executive of Fingal County Council, Paul Reid also welcomed this important announcement saying, “I am delighted Fingal’s focus on jobs and the local economy is paying dividends. Since the establishment of LEO Fingal just 6 months ago we are already creating real opportunities for businesses”. “This clearly shows that with the right supports, our small businesses can take centre stage leading economic growth and job creation", the Chief Executive said. Since opening its doors at Fingal County Council in May 2014, the Fingal Local Enterprise Office (formerly Fingal County Enterprise Board) has become the “first stop shop” for all start-ups and businesses in Fingal seeking supports from state agencies.